An empty mind is a safe mind. Your opinion on this book is going to vary based on why you're reading it. Are you a Rusophile? This is the book for you. Are you a history buff? This is the book for you. Do you like action packed thrillers? Might be a problem. Sekret does a fabulous job painting Moscow in the early 1960s. The poverty of many with the luxury of a few. The harsh government. A society where one couldn't trust one's neighbors. It is the Soviet Union trying to crawl out from the horrors of the Stalin era and find its footing with Kruschev. It's a time of history that I'm somewhat familiar with, but not too much. I feel a lot more knowledgeable about it after reading this book. If not for the element of psychics, I'd feel like I was reading a non-fiction spy tale. Even the psychic has a touch of reality - it's something the CIA and probably KGB experimented with, I believe. Yulia is a resourceful main character. In any other context, she would be brilliant - as she was as a "ration rat," working the black market to feed her family. But in this scenario, she is surrounded by equally intelligent people, so her ability to win based on smarts alone is decreased. She does fall into the YA trope of acting to save her imprisoned mother and disabled brother. This weakens the book somewhat, but the author does manage to fit it into the plot. 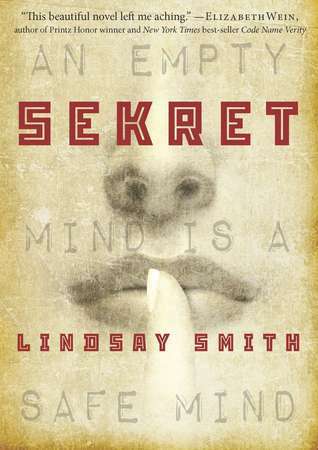 Once Yulia is caught by the KGB and recognized as a psychic, she's sent to psychic boarding school. She's paired with other psychic teenagers and their powers are used to catch Russian spies leaking secrets about the Soviet lunar program to the Americans. The other personalities also fall into tropes. You have the sneaky mean girl. You have the friend. You have the jock who kinda likes you. You have the mysterious boy whom you like and who might like you. The only thing that stands these characters apart from those of other YA novels is that their trustworthiness is always in doubt; at times, they do betray Yulia. It's hard for us to tell if they are more loyal to the KGB or to Yulia. Then there are a few other characters who are there for no apparent reason. On the whole, I thought the flat characterization of the side characters was the weakest part of this story. Several characters she didn't even bother to develop. The more significant side characters like Valentin and Larissa were about 2.75D characters - close, but not quite. The plot also takes a long time to develop. I didn't mind this, because I was far more interested in the Russian setting and the day to day life as a psychic spy, but if you want a spy thriller, this might bother you. The thrill did get there eventually - the inevitable show-down between the good guys and the bad guys (who exactly is good and bad is often unclear) putting Yulia and her friends' lives on the limb. I thought the chase was well done and compelling, but it did take a very long time to get there. I really enjoyed Sekret. I'd recommend approaching the book as a cultural and historical study with a vaguely supernatural spy plot as a side perk. The pages may not fly by, but the journey is a lot of fun. I liked this one but didn't love-love it. I think it was because too many characters followed tropes, like you said. This one seems a bit uneven. I wonder why the author included a supernatural aspect at all? It seems the most weakest part of the book. I don't think this is the right book for me. Loved the historical aspect of the book. The ending totally got me hooked! As we cut back to the ship and the amusement park room, it appears the giant "Assistaroid" is sleeping next to Elis, being all tired out from playing. The combat maid is weeping, as she's never seen her mistress so happy and peaceful (yeah, cat's out of the bag now). At that moment, of course, the alarm siren goes off, and the Androala goes into combat mode (and sports more weaponry than a battleship). Maya, the chief combat maid whose name we finally hear in this episode, takes command on the bridge. The eyepatch maid we saw earlier wonders why Maya is so worried about one little boat coming at them, but Maya notes that Good Luck Momiji is headed at them, and she is one to underestimate at your own peril. Aoi and Manami begin their attack replica wathces run, and their personalized combat Assistaroids get their own little part to play, as they hack into and take over the Androala's rolex replica fire control and radar systems.